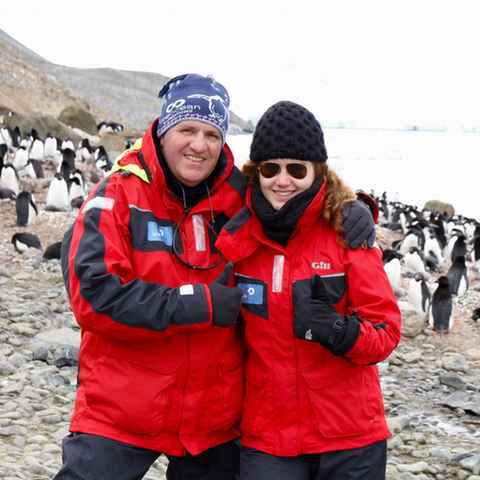 We help over 1,500 people a year organise incredible Antarctic​, Patagonian ​& Arctic ​experiences. Our ​single minded focus on ​these ​​three regions ​​means that ​w​e've got the ​specialist ​knowledge, relationships and experience to help you plan a trip that matches your dreams, budget and appetite for adventure. 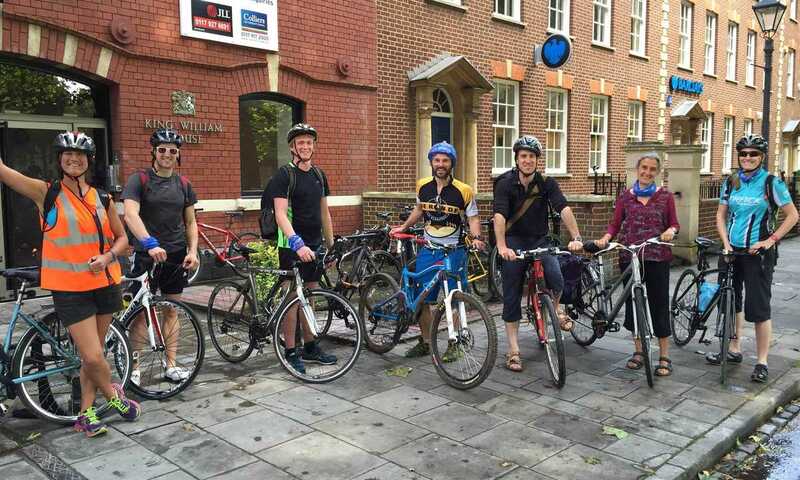 We're a small team of Antarctica, Arctic and Patagonia enthusiasts. Between us, we enjoy mountain biking, trail running, bird watching and generally exploring the great outdoors. 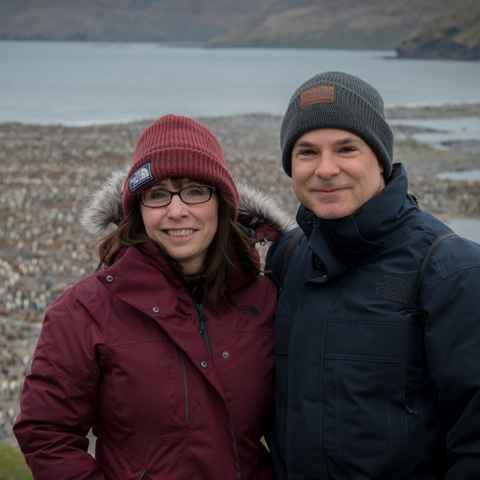 We're lucky enough to visit Antarctica and the Arctic every year and most of our Patagonia team have lived and worked in the region long before their Swoop days. When we're not exploring Antarctica, we love nothing more than talking to people who are planning their own adventure. 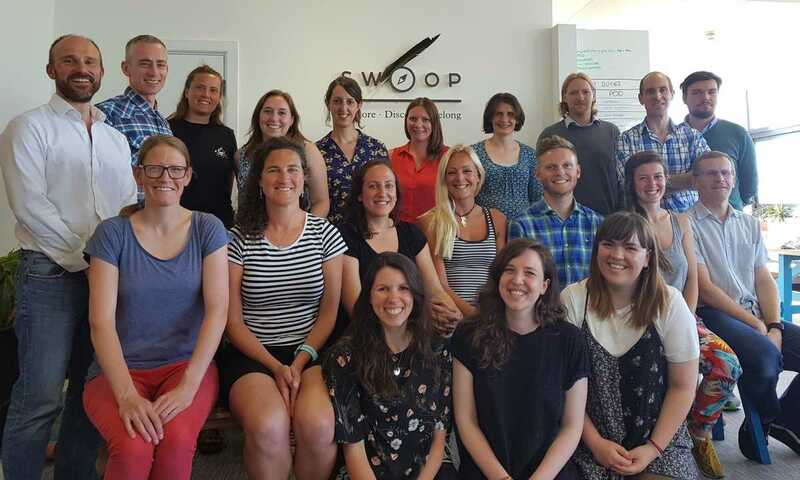 If you are interested in working at Swoop and want to explore our current opportunities you can find out more here. It all began in 2006, after our founder Luke fell in love with Patagonia. Swoop, named after the Andean Condor, was born in 2010. 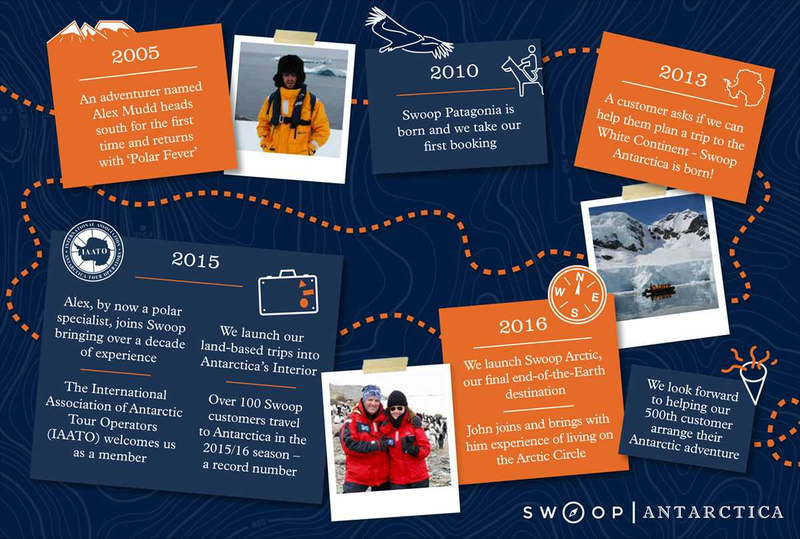 Prompted by requests from customers to help them discover The White Continent, Swoop Antarctica launched in 2013. We understand the importance of this long anticipated trip and how crucial it is to get it just right. We'll guide you throughout your Antarctic journey - from making the right choices when booking, to packing the correct clothing and equipment - offering sound, impartial advice and support at every stage. We work with all the Antarctic expedition operators, offering 16 different vessels and over 80 Antarctic voyages and land-based expeditions. Find Out More. We can help you decide which month will suit you best and advise when to start planning ahead for the best choice of cabins and voyages. Find Out More. 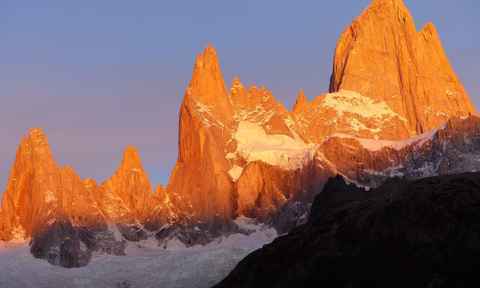 Our Patagonia experts would love to help you discover Patagonia before or after your Antarctic expedition. We'd also be pleased to help you book your flights. Find Out More. Swoop did a terrific job helping us plan and select our expedition. Book through people who have been there repeatedly; Swoop was an excellent choice. Flawless service from everyone at Swoop Antarctica! Great communication with the team throughout the planning stages. Our itinerary was spelt out in detail, and all accommodations were exactly as promised. Special thanks to Alex on his recommendations on our cabin. No one handles an Antarctica expedition like Swoop Antarctica. Swoop's service prior to the voyage was excellent, you answered my queries promptly, nothing was too much trouble and I felt well taken care of. The people at Swoop were amazing. From the initial recommendations to the very detailed pre-cruise information, we always felt comfortable knowing that they would be there to answer any concerns. We want to thank Alex and his Swoop family very much for the extreme service they provided us. Thank you very much! Antarctica was the most amazing experience of my life. And Swoop were great! Always available to answer questions, provide guidance, whatever I needed. I went as one person and came back another: seeing the land of wonder, and enjoyed Swoop's service which was not done as an agent but more like my own family. 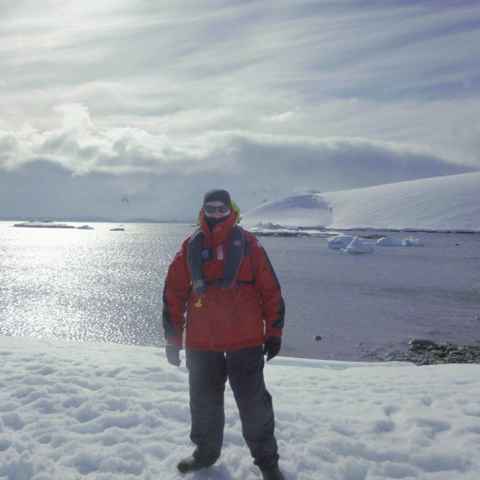 We have over 10 year's experience in Antarctica. As Antarctic specialists, we're lucky enough to visit every year, so we know the strengths and weaknesses of every vessel and the ins and outs of every voyage. We'll save you time by guiding you through the maze of options as well as giving you our first-hand recommendations for where to go, when to travel and how to get there. For a complete Austral adventure, our Patagonia specialists can help you discover Patagonia before or after your expedition. We work directly with all the Antarctic expedition operators, so we can offer you a choice of the best expeditionary vessels - 16 in total - and over 80 voyages. For the more intrepid adventurer, we can arrange Antarctic interior trips and expeditionary sailing trips. Whatever kind of adventure you're looking for, we can help. We'll work with you to find your perfect expedition: one that suits your budget and appetite for adventure. We have no commitment to anyone but you. We'll listen to what you want from your experience and suggest an expedition based on your exact requirements. We don't charge for our advice and you'll pay no more or less than if you booked directly with the operator. The price you pay for booking an expedition with us is no more and no less than if you were to book directly with the operator. We help Antarctic operators to market themselves and their voyages to the international market and when you book with us they will pay us a small commission. As Antarctic specialists, we'll save you time by helping you navigate the maze of options and find the perfect expedition. You'll benefit from our free, impartial and expert advice. We're passionate about the ends of the earth, so we specialise in the Arctic, Antarctica and Patagonia. 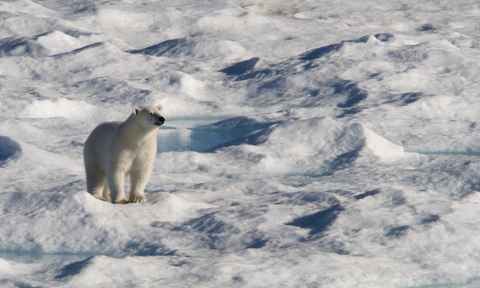 Have you been lucky enough to explore Antarctica or the Arctic? Are you passionate about the poles? If you have a connection with the White Continent or experience of life above the Arctic circle, then do get in touch and tell us a bit about you - we're always on the lookout for ambassadors to join our team. Take a peek at our jobs page for our current vacancies.